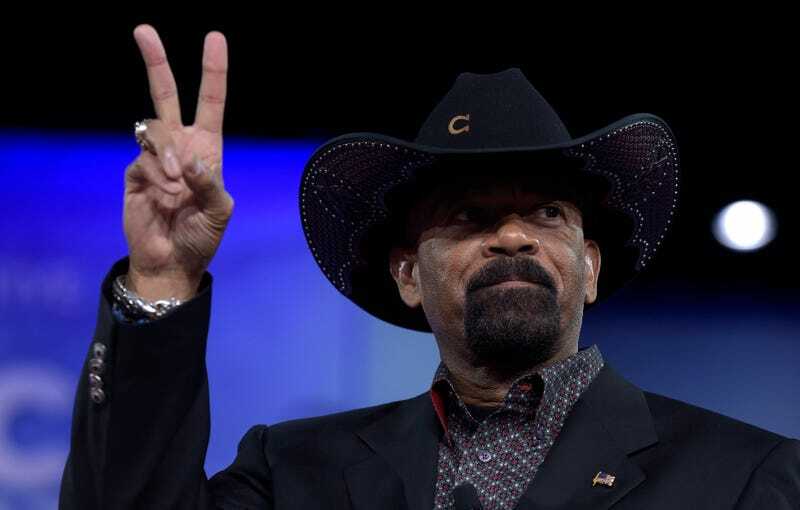 On top of managing a jail where people die brutally due to staff negligence or worse, Milwaukee Sheriff and possible soon-to-be assistant secretary of the US Department of Homeland Security, Davd Clarke Jr., can now add “plagiarist” to his sterling resume, a quality that the lying regime that may have just hired him will no doubt find attractive. CNN reported on Saturday that Clarke plagiarized several sections of his 2013 master’s thesis on US security, failing to properly attribute his sources 47 times. Clarke’s thesis, which he wrote to complete his degree in security studies at the Naval Postgraduate School in Monterey, California is titled “Making U.S. security and privacy rights compatible.” In each instance of plagiarism, CNN discovered that Clarke lifted language directly form his sources without putting quotation marks around them, although he does credit them in footnotes. Sources plagiarized by Clarke in his paper include the 911 Commission Report, a Manhattan Institute research paper, and George W. Bush’s book Decision Points. Earlier this week, Clarke announced on a Wisconsin radio talk show that he’d been appointed assistant secretary of the US Department of Homeland Security, a job he say he begins in June. Specifically, Clarke, a former Trump surrogate, said he’ll be working in the department’s Office of Partnership and Engagement as a liaison for state, local, and tribal law enforcement. The DHS has not yet confirmed his appointment. If you haven’t yet read about how monstrous this man is, please take the time now. For starters, there is pretty much nothing evil he won’t say. In 2014 he described people protesting the fatal shooting of Michael Brown in Ferguson, Missouri as converging, “like vultures on a roadside carcass,” and, of course, he’s one of those guys who’s fond of calling Black Lives Matter a “domestic hate group.” More crucially, if the rumors are true, Clarke is leaving his old job administering the Milwaukee County Jail, where four people have died in the last year, including the baby of an incarcerated woman. A lawsuit filed against Clarke in March alleges that deputies refused to unshackle the infant’s mother when she went into labor, a practice that poses health risks to pregnant women. In another instance of the jail’s managerial cruelty, an incarcerated man ostensibly kept in solitary confinement because he was bipolar, died of dehydration after his water was turned off. Here’s hoping that Clarke, like his fraudulent citation style, winds up being an embarrassing footnote.